BEST VALUE PACK WITH FREE BONUS GIFTS: LED safety armband (VALUE £5.95) for a more enjoyable running experience. The latest technology for nighttime safety.Three Modes:solid,fast and slow flash.Use on your arm wrist,ankle or attached to running belt. TOUCH SCREEN COMPATIBLE & PHONE HOLDER WHILE YOU RUN, OR WORKOUT: You can now see the run stats, change music or answer a call without stopping. 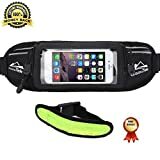 This waist pack fits perfectly all smartphones from iPhone 6 6+ 6S Plus Samsung Galaxy note 4 S6 S5 Moto X Nexus 5 – Even with the case on and headphone jack.You can now walking, running, hiking, biking, work-out, marathon, travel with your phone attached to you. FITS YOUR WAIST SIZE PERFECTLY & NO BOUNCE. NO RIDE UP: The belt Is adjustable and can fit extra small waist sizes 27″ up to 47″. And It’s made of high quality elastic expandable strap for perfect fit. NEVER DAMAGE OR LOSE YOUR BELONGINGS. Made out of SWEAT PROOF Foam Padding so your belongings stay dry at all times. You have three separate pockets for your money ID, credit cards, keys and other essentials. Enjoy your run without fear of damaging or losing Anything. 100% MONEY BACK GUARANTEE & PROTECT YOUR INVESTMENT: We love our customers and want them to love us too. If You Don’t Like It, You’ll Receive A Full Refund With Our 90-Days 100% MONEY BACK GUARANTEE! Are You Looking For A Quality & Extremely Convenient Running Belt? Then You Have Come To The Right Place! This belt has been created to provide you maximum comfort when you are running – It’s designed to distribute the weight evenly while also causing the least disturbance possible! 1. EXTRAS – ONLY THIS BELT includes a premium LED safety armband at NO ADDITONAL COST – Run with safety even when you are in the darkness! 2.YOUR SAFETY IS #1 – Be safe! Super sleek reflective zipper and multifunctional LED illuminated armband, specifically designed with your safety in mind. 3.TOUCH SCREEN COMPATIBLE – Have full access to your phone screen without taking out your phone. Change songs, answer phone calls, and look at running stats without taking out your phone. ? 4.HOLDS EVERYTHING YOU NEED – Spacious pockets that hold everything you need. 5.FULLY ADJUSTABLE AND COMFORT – Super snug comfortable fit with no bounce. 27″ To 47″ waist size. 6.SWEAT-PROOF MATERIALS – Has an interior sweat barrier and foam padding to protect your phone and belongings. Made from tough ballistic nylon material that won’t tear on you. 7.SPECIAL KEY COMPARTMENT AND KEY RING – Never Scratch Your Phone With Your Keys. Spacious Front Pocket For Money, Credit Cards and More.? 8. MULTI-USE DESIGN – Use as: money belt, carrying belt, fanny pack, fuel belt, carrying pack, a pouch for walking, hiking, biking, exercise / fitness, or travel. Modern vibrant unisex design for men or women! What Are You Waiting For? Click Add To Cart Now & Get The #1 Running Belt On Amazon!